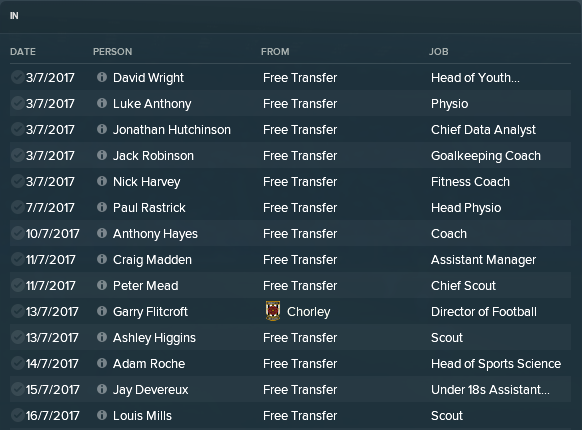 So here it is, my journey into the world of football (manager). My aim in this career is to win as many trophies as I possibly can. I will be beginning my journey with my favourite team, Tranmere Rovers of the Vanarama National League. Given the fact that we already have a very good squad for this division and one which is fairly balanced, I didn't really feel the need to make a lot of signings. I quickly decided that I was only going to bring in a couple of loanees as this would help to save on the wage budget. There were two players that I had in mind, both currently loanees at Prenton Park in real life but not present on the game. My first signing was Nottingham Forest striker Gerry McDonagh, one of the two players currently on loan at Tranmere in real life. The 19 year old Irishman spent last season on loan at Wrexham and then Cambridge. During his time at Wrexham, he made 21 appearances and scored 5 goals. I'll be the first to admit that this isn't the best record but from what I've seen of him, he has potential. I honestly think that in a better team he can shine and hopefully I can bring the best out of him. 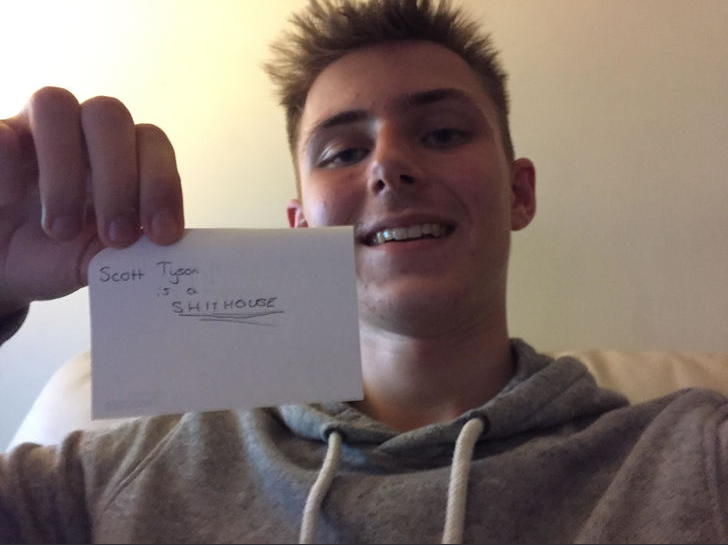 Dylan Mottley-Henry has been setting Prenton Park alight in real life so he was a man I definitely had a bring in. How much he will play for me though is a mystery at the moment as he'll be fighting the likes of Larnell Cole and Jake Kirby for a starting place. With stats of 16 in pace and acceleration, Dylan has the potential to scare opponent just with his pace alone! He could be one hell of an impact sub if I decide to use him that way. My third loan signing was Charlie Scott from Manchester United. Able to play at both right back and centre back, Charlie's versatility is invaluable to a side like us. My thinking at the moment is that Charlie will slot into the right back role with Adam Buxton moving over to the right, however that will depend on the performances of the centre backs. Callum Gribbin is another loan signing from Manchester United. Callum is a centre midfield player whose stats make him a great signing at this level. I wasn't originally planning on signing a central midfield player but an incident in September forced my hand (I won't spoil what it is). Arguably my best signing of this window is Welsh midfielder Chris Dawson on a free transfer. According to my scouts, this guy should be playing in League Two, maybe even League One. When I offered him a deal, I didn't think we had a chance of signing him but he's agreed and will fit perfectly into the deep lying playmaker role. My final signing was Aleksandar Gogic on a free transfer. 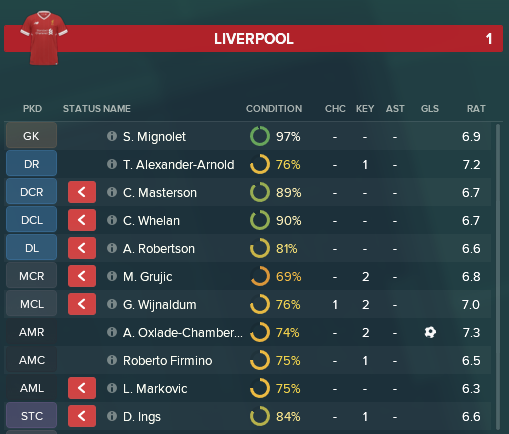 During our pre-season campaign, I noticed that the only backup we had to Scott Davies was young Welsh keeper Luke Piling, who is nowhere near ready to be playing in the first team. It was then that one of my scouts mentioned Gogic and I decided to sign him based on his recommendation. Some top signings there, Tranmere are a big fish in a small pond for sure so it'll be disappointing I'm sure if you fail to go up this season. Expectations are certainly high and for good reasons. 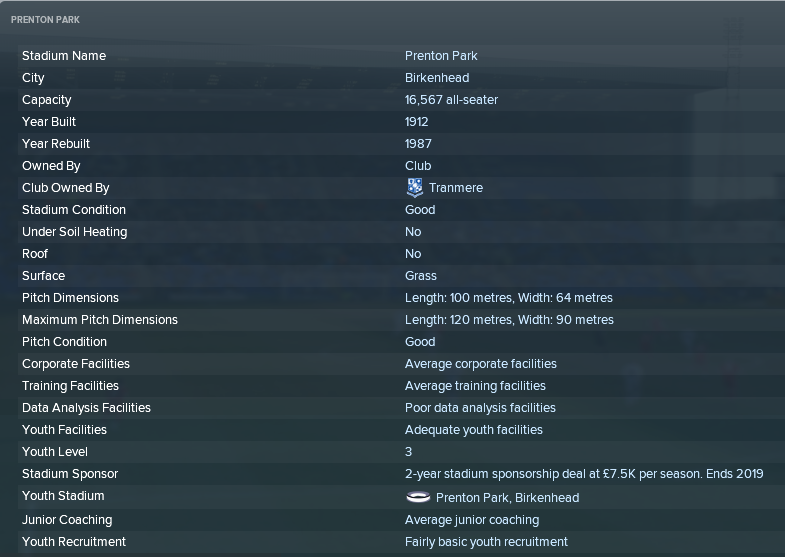 2017-11-06 19:15#247000 ScottT : Some top signings there, Tranmere are a big fish in a small pond for sure so it'll be disappointing I'm sure if you fail to go up this season. Expectations are certainly high and for good reasons. Promotion is definitely the aim for the first season but it's not guaranteed by any means. The National League is a difficult league to get out of. Then the hard work began. Recruiting for every single staff role is hard work let me tell you. In terms of the coaching team in came Craig Madden, David Wright, Jack Robinson, Nick Harvey and Anthony Hayes. I did have plans to bring in a tactics specialist too but the board wouldn't allow me to hire anymore coaches due to budget restrictions. Into the recruitment team came five guys, four I wanted and one that I didn't. Out of the five, Peter Mead, Jonathan Hutchinson, Ashley Higgins and Louis Mills where the guys I brought in. For some reason or another, the chairman thought it would be a good idea to bring in former Blackburn man Garry Flitcroft as Director of Football. What does a Director of Football even do? On the medical side of things, we've brought in Paul Ratrick, Luke Anthony and Adam Roche, the latter heading up the Sports Science department of one. I did want another sports scientist but unfortunately the board wouldn't allow me to bring in another one. I did actually want Luke Anthony as the Head Physio but he would only take on a regular physio role. Pre-season was as you would expect really. The main aim was to get the players match fit and trained on the three (4231, 4222 and 442) tactics that we'll be using over the course of the season. In terms of friendlies, I decided to have three at home against higher opposition and three away against lower league opposition. As you'd expect, we won the three away and lost the three at home. Despite the fact that we lost the three home games, I was pleased. In all three games, we only lost by one single goal and gave a good account of ourselves, which was the whole purpose of playing those sides in those guys. At the end of pre-season, squad morale is high and the lads seem pretty confident going into the first League game of the season away at Torquay. Only losing 1-0 to THIS Liverpool side! Not a bad pre-season at all, you've been quite competitive in each game against tougher opposition and beaten the sides you expect to. Suggests to me that a successful season is ahead. I'm hoping that you're both right!! You are reading "John Warrington - The Journey to Greatness".